When I first started getting into bass fishing, I used 3 or 4 rods for all my lures and techniques. It worked well for a few years until I got better at fishing certain techniques. I realized some of my rods weren’t quite right for the application. One of those techniques was fishing crankbaits. My medium power rod was fine for cranking at first, but I was losing out on casting distance and was losing some fish. I decided it was time to invest in a few crankbait specific rods to take my cranking to a new level. I learned a lot about what makes a good cranking rod, and I’ve collected my knowledge into this guide. Do you really need a Cranking Specific Rod? But the fishing industry has done a great job marketing highly specialized rods to us weekend anglers. They have it planted in our heads that we need a special rod for every single technique. This is false in many cases for the weekend angler. Most anglers will do well to have a handful of multi-purpose rods for the majority of their fishing. However, when it comes to certain techniques, specialized rods just perform better. Frog fishing, punching, drop shot fishing, and fishing crankbaits being the most notable. As your crankbait fishing skills develop, you can benefit greatly from investing in a few good cranking rods. Here are some benefits of crankbait rods. Improved Casting Distance – Rods designed specifically for fishing crankbaits transfer more energy from the rod to the lure. They do this by having a softer action (more flex), which puts more energy into the rod blank. This creates a slingshot effect when the energy is released on the cast follow through. When paired with a proper cranking reel, casting is optimized for distance. Improved Hooksets – A better hookup ratio is another major benefit to using the more limber cranking rods. The natural reaction is to set the hook when you feel the telltale thump of a bite. A quick hookset with a fast action rod can actually pull the bait out of a fish’s mouth. The softer section of a crankbait rod creates a delay effect that allows the fish to really get the bait in their mouth. Less Snags, Better Feel – Finally, anglers will experience far fewer snags (and less frustration), and better feel for the bait working on the bottom. The delay action of a soft tip gives the bait time to deflect off objects instead of pulling into them. The more you fish crankbaits, the better you will learn to control the crankbait, keeping it in the strike zone longer. In the video below, Kevin Van Dam (a legit cranking master) describes why he uses specialized cranking rod setups. Now I want to review these rods in more detail. Some of the rods aren’t marketed as cranking rods, but they have all the right characteristics of one. Pros: High quality Premier rod blanks, lighter than the equally priced Mojo Glass rods. Cons: Rods lengths max out at 7′-0″. Best Cranking Rod for the Money: The Premier Crankbait rods have been redesigned for 2018, now with four models ranging from 6’6″ Medium-Moderate to a 7′ Medium-Heavy/Moderate. The Premier utilizes the SCII graphite blanks, with newly engineered tapers designed form fishing crankbaits. The result is a lightweight, sensitive rod that has the flex and power needed to work crankbaits for bass. PC66MM – This 6′-6″ Medium-Moderate rod is perfect for squarebills, small crankbaits, and spinnerbaits. PC66MHM – This Medium-Heavy Moderate powered rod has the backbone for ripping lipless rattlebaits and bladed jigs through grass. PC70MM – Increasing the rod length by 6 inches increases your leverage for casting and cranking on fish, making it ideal for medium diving crankbaits. PC70MHM – This 7 footer increases the power to MH, and is ideal for deeper diving crankbaits that weigh 1/2-1.0 ounces. Pros: Great price, great Lew’s customer service, Winn Grip handles. Cons: Just the one cranking rod in the series. Best Cheap Crankbait Rod: There are a bunch of models in the TP1 lineup, make sure you select the 7ft-3in model (TP173MH-CB) that has Medium Heavy power and Medium action. This is the right combination for all-puprose crankbait fishing. This rod is a slick all-white graphite rod, with a white Dri-Tac Winn Grip handles. The IM8 rod blank ensures great sensitivity, and even has micro-guides. For around a hundred bucks, this is a heck of a cranking rod. Pros: Near top of the line materials, excellent sensitivity. Great for Lipless Crankbaits: All of the Avid rods are pretty stellar, and the AVC70MHM might be one of the best crankbait rods for lipless crankbaits. 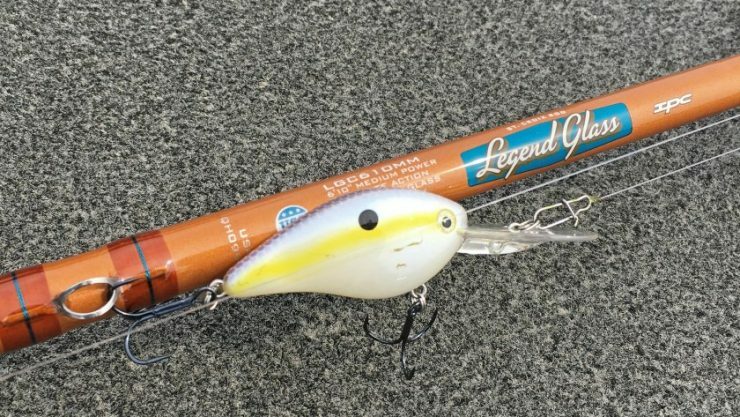 It has the Medium Heavy power for ripping and popping a lipless through grass, and a moderate poly curve action for keeping the big bass hooked. As a bonus this model would also double well as a bladed swim jig rod. Pros: 2 models, great balance, lightweight, affordable. Cons: Foam handle, average guides. Best Crankbait Rod Under $150: If you want to get into cranking without spending a fortune, the Ike Winch cranking rod is great. The rods utilize graphite blanks with a HSG (high strain glass) blanks. That is a fancy way of saying the rods have the proper parabolic action for throwing crankbaits. The guides are titanium with zirconium inserts. Those aren’t quite Fuji grade you’d get on a high dollar rod, but good enough. Anglers also appreciate the ratcheting reel seat and EVA foam handles. There is just one Ike Winch cranking model, a 7″-10″one, rated for casting crankbaits 1/4-1oz. For a rod that size, however, I think you would have trouble casting the lighter cranks. I would only recommend this rod for for medium to large crankbaits. Pros: Lightweight, all purpose cranking, with the strong Fenwick reputation for quality. Cons: Only one size rod for cranking in the series. Good All Purpose Cranking: Fenwick makes really great rods. Both the HMX and HMG series have been very popular for years. With the Elite Tech Bass lineup, they have successfully jumped into the technique specific rod market. There are 5 rods in the series, with the ETB72MH-MC model being the best suited for crankbait fishing. This 7′-2″ rod features an all graphite blank, titanium guides, and a split grip foam EVA/TAC handle. The TAC improves the grip in wet conditions, which I can appreciate trying to launch big crankbaits in rainy weather. The rod is rated for 10-20lb line and crankbaits weighing up to 1 oz. These qualities make the Fenwick Elite Tech Bass cranking rod a great choice for all your cranking needs, from shallow, to medium and deeper diving crankbaits. Pros: 3 different cranking models, cork handles, premium G Loomis rod blanks. G Loomis has always been known for premium (expensive) fishing rods, typically costing up to $400-500. That price range put most of Loomis cranking rods out of reach of the weekend angler. To reach new anglers, they came out with the sub $200 E6X series of rods. 3 of these rods are crankbait models and are worth a look. All the E6X cranking rods are built from high quality 7 foot graphite blanks, with varying soft actions to effectively fish all kinds of crankbaits. E6X 843C CBR – This rod has the softest action in the group and is rated for 8-14lb line and crankbaits up to 5/8 oz. We recommend this rod for squarebill crankbaits up to medium divers. E6X 845C CBR – This is a Medium-Heavy rod with Moderate action. The extra power upgrades the line rating to 10-20lb and the lure weight to 1 oz. This rod is good for all but the smallest balsas and biggest deep diving crankbaits. E6X 847C CBR – This is the beast crankbait rod, to be used on the big plugs like a Strike King 10XD. The additional power and Medium-Fast action tip makes it the best rod for deep diving crankbaits, handling lures up to 1-3/8 oz cranks. Pros: 3 different models, good price point. Cons: Slightly heavier than higher priced rods. 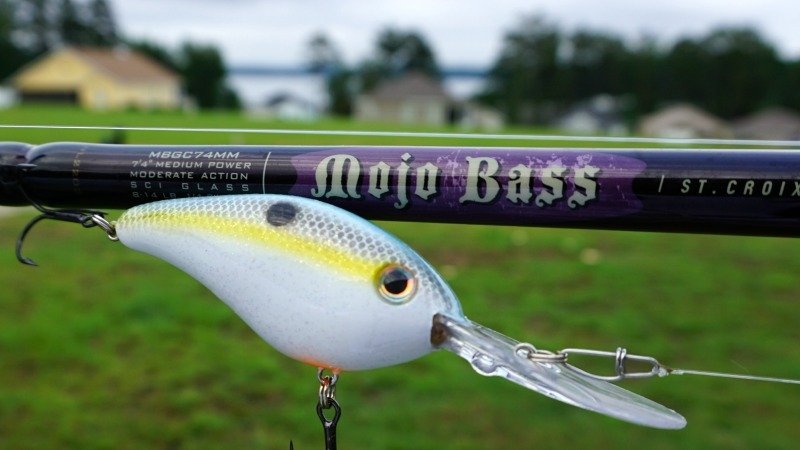 The Mojo Bass rods are popular species specific rods from St. Croix. They sort of started the trend towards building special rods for specific techniques. It really does help anglers looking for a new rod to see what type of lures it will work best with. The 3 cranking rods follow this model. I own two of these rods, and they have been great for improving my crankbait game. Target Cranker (MJGC610MM): At 6’-10” this is the shortest, and best rod for squarebill crankbaits. I use this rod for throwing KVD1.5 and KVD2.5 squarebills along wood and rip rap banks, as well as over shallow brushpiles. Crankster (MJGC74MM): The Crankster is the all-purpose cranking rod. It’s got enough length and action for fishing a wide variety of crankbaits. I use the Crankster for fishing Rapala DT10, DT14, DT16, and Strike King 5XD, 6XD crankbaits. Big Crankster (MJGC78MHM): I don’t have this rod, but if I did I would use it for fishing the really big crankbaits like the 8XD and 10XD. IF you plan on casting heavy 1.5oz+ cranks you really need that Medium-Heavy power so you aren’t overpowered by the lure. Pros: Premiers are some of the best spinning rods for the money. Cons: Cheaper guides than on the Avid line. Best Rod for Light Crankbaits: Smaller balsa crankbaits, like the Shad Rap, are really difficult to cast on baitcasting gear. There is the tendency to backlash due to the extra effort needed to cast the lighter lures. A good spinning rod for crankbaits will be around 7 feet long, with a medium power and fast action. Pair it with a large capacity spinning reel and you can really fling lighter crankbaits. One of the best is the PS70MF St. Croix Premier. The fast action tip compensates for the naturally slower speed on spinning rods. There are tons of rods to choose from and from an array of different brands. Some brands are starting to name their rods by application, making it easy to identify their cranking rods. For the others, you need to understand the rods specs for cranking. Here are the key aspects to consider when selecting a crankbait rod. These two related specs get easily confused by anglers. To keep it simple, think of rod Power as how much load (force) it takes for a rod to bend, or as the amount of “backbone”. Action is the speed at which the rod backbone is engaged. 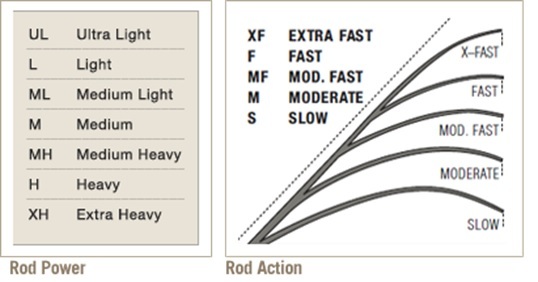 An X-Fast rod will reach the backbone quickest (least amount of flex), while Slow action rods use most of the rod length to Reach the stiff backbone (most amount of flex). Take a look at the table below to visualize these concepts. Most cranking rods will fall into the Medium to Medium-Heavy power, and a Moderate, Moderate-Fast, or Fast action rating. Which power you choose depends on the type of cranking you intend to do most frequently. Medium power rods are best for fishing medium to deep diving crankbaits. Medium-Heavy power rods are best for fishing around grass. The extra stiffness is helpful to rip the bait free from vegetation. Moderate action helps control your lure and prevent yourself from pulling the hooks into rocks and wood. The soft action is forgiving and lets the bait deflect instead of snag. The best rod length for cranking is going to be determined by the size of line and lures you plan on using. A 7 to 8 foot cranking rod will cast the bigger medium and deep diving crankbaits much better than a 6’-6” rod will. The longer length allows energy to load up into the rod, making long casts easier. On the other hand, a 6’-6” cranking rod will be a better choice when fishing smaller crankbaits. The shorter length greatly improves casting accuracy. This is crucial when fishing squarebills around the bank. The closer and more accurate you are placing your lures, the more likely the crankbait will grind and deflect off the cover. In the old days, all bass fishing rods were fiberglass. You know, the buggy whip style rod like an Ugly Stik? Thankfully today’s rods have advanced far beyond those designs. There are all graphite cranking rods, and all fiberglass cranking rods. There are even graphite/fiberglass composite rod designs. In the end it doesn’t matter a whole lot, so long as you select a rod that is the right length, has a medium action, and enough power to cast whatever size crankbaits you like to fish. The last key to the cranking puzzle is pairing your new crankbait rod with the proper reel. Making long casts requires a lot of line. Crankbait reels should have a good line capacity in the 10-15lb test range. This is not as important with shallow running crankbaits where you are making shorter, pinout casts. Selecting the right gear ratio is also critical. For the vast majority of crankbait fishing, a reel with a gear ratio of 6.2:1 or less will work well. The lower the gear ratio, the easier it is to get your bait down and keep it there. Once your bait has reached the bottom, it’s easier to keep it there and maintain contact with structure, down where the fish are.